Are Arab World Revolutions different? When the first demonstration took place in Sidi Bouzid after Tarek (Mohamed) Elbouazizi ignited the Arab revolutions by setting himself on fire in protest, the Tunisian government played down the event claiming that it was a local matter. Two weeks later, the protests became an uprising and spread to most Tunisian provinces forcing the head of the authoritarian regime, Zine El-Abidine Ben Ali, to seek refuge in Saudi Arabia. Before the dust had settled in Tunis, another uprising was launched in Egypt. The Egyptian regime argued that Tunisia is not like Egypt and Mubarak is not like Ben Ali. Less than eighteen days later, Mubarak was forced to hand over power to a military council and two months later he, some of his family members, and key members of his regime were arrested and jailed while charges of corruption and murder of protesters were being investigated. Even before the fall of the Egyptian regime, massive protests in three other Arab countries were underway. In Yemen, millions of people crowded public squares chanting, “al-shaab urid isqat al-nizam” [the people want to bring down the regime]. Despite the similarities, the Yemeni president, Ali Abdullah Saleh, declared that he was going to finish his term in office insisting that Yemen is not like Tunisia or Egypt. 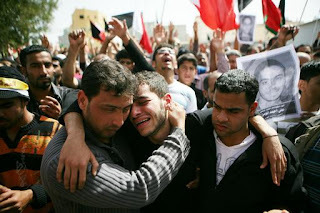 After weeks of protests, many military, police, and political officials abandoned Saleh and announced their support for the “youth’s revolution.” As this piece is being written (April 23, 2011), Saleh has accepted a compromise plan developed by the Gulf states that offers him immunity in exchange for transferring power to his deputy in thirty days. The protesters are likely to reject the idea of immunity for Saleh and his henchmen, especially after contemplating the rise of civilian casualties killed by Saleh’s security forces. In Bahrain, protests that paralyzed the small kingdom were brutally put down by a Saudi and Emarati military forces that began its intervention by destroying the monument near which the protesters had set camp. The Bahraini King’s government followed that by declaring a state of emergency. Human rights groups have released numerous reports detailing the brutality of the Bahraini regime during and after the first wave of protests. Nonetheless, Bahrain rulers, too, insisted that the demonstrations in their country are different from those in Tunisia, Egypt, and Yemen. They contended that it was sectarian tension stoked by Shi`i Iran. After the fall of Mubarak, it would seem that nervous Arab authoritarians are inclined to do whatever is necessary to stop or at least slow down the revolutions. Therefore, the Gulf rulers decided to draw a line in the sand of Bahrain: they decided to take the side of the King instead of siding with the people. The Libyan leader, Muammar Qadhafi, was hoping that the Arab leaders would stand by him as well. It must be recalled, however, that the Libyan self-styled leader faulted the Tunisian people for ousting Ben Ali. He argued that Ben Ali was a good leader and he should have been allowed to serve his full term. Naturally, then, when demonstrations broke in his country, Qadhafi was determined to crush any uprising arguing the same thing: Libya is not Tunisia or Egypt and that he is not a president like Ben Ali and Mubarak. He launched a brutal military operation against peaceful protesters who reacted by arming themselves and appealing to the military and police forces who sided with them to fight back. Qadhafi escalated by deploying his air and naval forces to attack the liberated towns and cities. The United Nations Security Council then imposed a no-fly zone and authorized the world community to do all that is necessary to protect civilians. Meanwhile, other, less massive demonstrations took place in Saudi Arabia, Jordan, Oman, Morocco, Iraq, and Algeria. They were all—to varying degrees of success—put under control by their respective regimes who, too, thought that their countries were different from Tunisia and Egypt. The most significant developments were the demonstrations and evolving demands by the Syrian protesters. Bashar Asad, again, reacted by claiming that his country is different from Tunisia and Egypt. Given the various facts and claims, then, is it true that each Arab country is fundamentally unique to the extent that that will make it impervious to the Tunisian and Egyptian phenomenon? I would argue, that the majority of the differences distinguishing one Arab country form another are absolutely irrelevant when it comes to the driving force behind these revolutions: respect for citizens’ dignity. It is true that Libya and Yemen are more tribal then Egypt and Tunisia. It is also true that Morocco and Jordan, unlike Tunisia and Egypt, are traditional monarchies who derive their legitimacy from their affinity to the Prophet Muhammad. Similarly, it is true that Saudi Arabia and Oman, not like Tunisia and Egypt, are ruled by kings and sultans who use their vast petro-wealth to buy the loyalty of a large middle class shielding them from the marginalized. Likewise, it is true that Bahrain has more Shi`is than Tunisia and Egypt—about 70% of the population. Lastly, it is true that the Syrian regime has antagonized the West and its Arab allies when it came to the most popular regional issues in contrast to Tunisia and Egypt and aligned itself with the masses. However, all these regimes have one common denominator: they all retain power for life and they do not respect the dignity of their peoples. All Arab countries where protests took place are run by corrupt, authoritarian, and despotic regimes that do not allow dissent, torture their citizens, and imprison political dissidents. The rulers and/or their parties control the executive, legislative, and judicial authorities and they do not tolerate true civil society institutions. Most Arab peoples, especially the young and educated generation which makes more than 60% of the populations in most Arab countries, think that stripping them of their dignity occurs when they are treated as if they are incapable of knowing what is right and what is wrong. They no longer accept the proposition that national security, prosperity, and stability are predicated on having one leader or one party running the government for life. This generation of Arabs is now demanding respect and wants the regimes to treat everyone with dignity or degage—as the Tunisian youth had said… Leave! With the fall of the Tunisian and Egyptian authoritarians, the Arab peoples have crossed a threshold. They have overcome fear and believed in the power of the people to make change happen, and in most cases, happen peacefully. The remaining Arab dictators are delaying the inevitable: they will all go or become isolated in a world that does not seem to tolerate the prescription of a president, king, emir, or “leader” consolidating and monopolizing power for life in return for stability and security. The peoples have learned that that is a false dichotomy and unjust trade. * Ahmed Souaiaia, teaches classes in the department of Religious Studies, International Programs and College of Law at the University of Iowa. Opinions expressed herein are the author’s, speaking as a citizen on matters of public interest; not speaking for the University or any other organization with which he is affiliated.